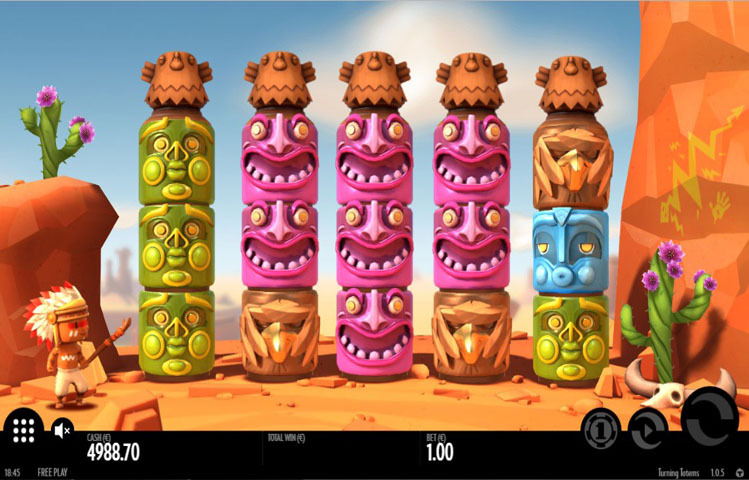 Turning Totems is one of the newest games to be released into the market. This new game is powered by Thunderkick. This is why players can immediately expect an original game that is fun, exciting and comes packing many winning chances. This is exactly what the game offers. The game has a Native American theme that is unique and new. The game has a unique setup, with amazing visuals and animations. Players can check out this new game and what it has to offer right here for free. This way they can give the game a few spins and see what it is all about prior to placing real money bets at casinos that offer Thunderkick games. Turning Totems is a 5 reel game that has a great theme. This is because the game takes players on a Native American experience. This is why the game’s title is Turning Totems. This is also why players will see a young Native American child in 3D animations joining them on the left side of the reels during the game play. So players will get to claim their share of the Native American fortunes through the totems that form the reels of the game. Players will place bets with ease under the reels. They will just need to click on the Bet icon. This will open the betting page. This page has a number of fixed wager amounts that players can pick from. The bets vary between 0.10 and 100. Players will then click on the spin button initiate the game. There are other buttons at the control panel such as the paytable, the auto play and the sound option. The new game has a Native American theme. This is why players will see that the reels are formed by 5 big totems. These totems have symbols on them. Whenever players spin the reels, symbols will turn and rotate, and they will not spin like regular reels and slots. This is why the game title is turning Totems. The symbols appearing on the totems include face masks, birds, thunder snakes and more. All symbols come in great animations, which provide players with an amazing visual experience. Like any Thunderkick slot, players can expect special features and icons. There is the Thunders snake icons. Whenever this icon lands on any totem reel, it is going to turn it into a thunder reel. This means that all sleeping wilds will be brought to life. That is not all, as this would also trigger a re-spin. Also, whenever players manage to get 3x Thunder Reels, this will trigger the bonus round of the game. This bonus round gives players 5 free spins on the slot.